We all love tomato sauce. To the surprise of some, this delicious creation is one of those rare foods that actually tastes good and benefits the human body. 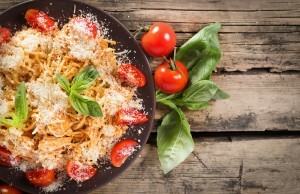 Tomatoes and tomato sauce improve biological functions in countless ways. Keep reading to find out how tomatoes work their magic. The consumption of tomatoes has long been tied to improved heart health. Tomatoes and extracts from tomatoes decrease total cholesterol, the LDL form of cholesterol and triglycerides. Tomato extracts also assist in the prevention of platelet cell clumping within the blood. The result is a reduced risk of heart health problems such as atherosclerosis. The phytonutrients within tomatoes are responsible for this heart health benefit along with numerous others. Tomatoes also regulate fats in the bloodstream to boost cardiovascular health. Tomatoes are an excellent source of lycopene, a carotenoid pigment provides an array of health benefits. Medical studies have shown a connection between the consumption of tomatoes and improved bone health. This is likely due to the fat that there is an abundance of antioxidants and lycopene in tomatoes. Contrary to popular opinion, lycopene is found in tomatoes of all colors, not just those of the deep red variety. Tomatoes contain a considerable amount of vitamin C, beta-carotene, mineral manganese and vitamin E. Most of these vitamins and minerals are powerful antioxidants and/or provide numerous other health benefits. The presence of vitamin C is particularly strong in tomatoes. Those who cook tomatoes will be happy to know that the cooking process does not eliminate this vitally important nutrient. A whopping 18 milligrams of vitamin C are found in one cup of cooked tomatoes. Aside from warding off sickness, vitamin C also helps the body produce collagen and even improves brain functions. Research has shown that tomatoes provide numerous anti-cancer benefits. Though studies have not been conducted to determine the impact of tomatoes on each type of cancer, it is clear that the antioxidants in tomatoes are critically important in the fight against cancer. A good portion of cancers begin to form as the result of chronic oxidative stress and inflammation. The anti-inflammatory and antioxidant properties of tomatoes go a long way to decrease the odds of cancer. In particular, the odds of prostate cancer are significantly reduced when one consumes tomatoes. It is likely that the link between tomato consumption and low incidences of cancer will continue to strengthen as more studies are conducted on specific types of cancer. Diets that are rich in tomatoes have also been proven to decrease the odds of certain neurological diseases such as Alzheimer’s disease. Multiple studies have also shown that tomato consumption is linked to a lower risk of obesity.